Two friends on opposite sides of the aisle provide a practical guide to grace-filled political conversation while challenging readers to put relationship before policy and understanding before argument. More than ever, politics seems driven by conflict and anger. People sitting together in pews every Sunday have started to feel like strangers, loved ones at the dinner table like enemies. Sarah Stewart Holland and Beth Silvers say there is a better way. As working moms on opposite ends of the political spectrum and hosts of a fast-growing politics podcast, Holland and Silvers have learned how to practice engaging conversation while disagreeing. In I Think You're Wrong (But I'm Listening), they share principles on how to give grace and be vulnerable when discussing issues that affect families, churches, the country, and the world. They provide practical tools to move past frustration and into productive dialogue, emphasizing that faith should inform the way people engage more than it does the outcome of that engagement. This urgently needed new book reveals how to talk about politics in a way that inspires rather than angers and that pays spiritual dividends far past election day. As working moms on opposite ends of the political spectrum and hosts of a fast-growing politics podcast, Holland and Silvers have learned how to practice engaging conversation while disagreeing. 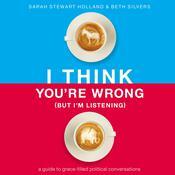 In I Think You're Wrong (But I'm Listening), they share principles on how to give grace and be vulnerable when discussing issues that affect families, churches, the country, and the world. They provide practical tools to move past frustration and into productive dialogue, emphasizing that faith should inform the way people engage more than it does the outcome of that engagement. This urgently needed new book reveals how to talk about politics in a way that inspires rather than angers and that pays spiritual dividends far past election day.